I got a great box of fruits and veggies from my buying club this past week and we have been enjoying them a lot! We got lots of Rainbow Chard, Broccoli, Peppers, Onions, Spinach and Zucchini amongst others and it has been a lot of fun figuring out what to prepare with all these beautiful veggies. Your pink hummus looks amazing and I can’t wait to get some beats so that I can try it out. A loves hummus so I would love to see if he would like this one as well. I am sure he will. So I made two great crustless quiches with all the delicious veggies that we got because sometimes life gets so busy that we sadly end up wasting some of the veggies we get. So this time around I made up my mind to create something special with them all. I still have a lot of Zucchini and Spinach left with which I will create something else. I don’t think that I had ever tried making a quiche before these two. I had played around with a vegetable casserole type dish or just a mixture of veggies baked with some tomato sauce and cheese. The quiches much yummier than anything I had made before and the great thing about the recipe that I am about to share with you is that you can substitute the vegetables, the cheese, and the liquid (milk) for your favorite ones! (which is what I did both times!) I got this recipe from Joy the Baker. I truly love her posts and playing with her recipes. I made a few changes to her recipe which you can compare if you want from the original which is linked below. 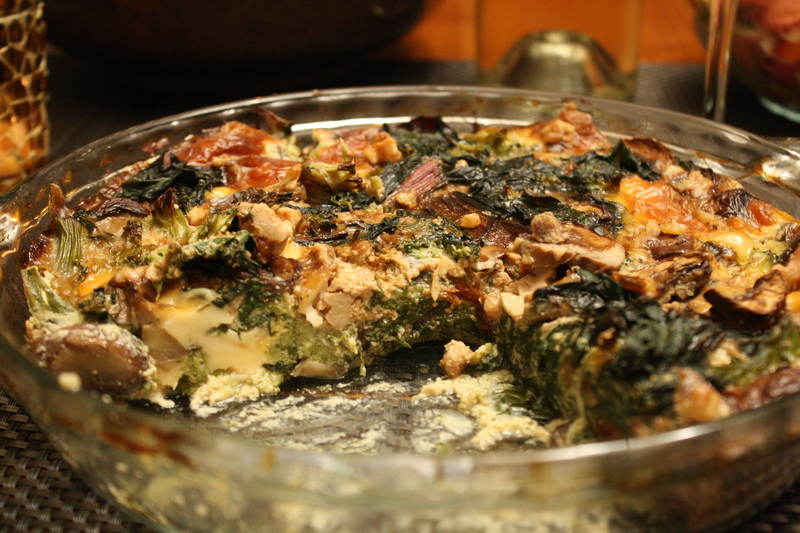 What is great about a quiche is how versatile it is in terms of how you can eat it and when you can eat it. I feel like it can be eaten for breakfast, lunch, snack, or dinner and it can be eaten cold, warm or hot. How cool is that! This is what I did the first time around. 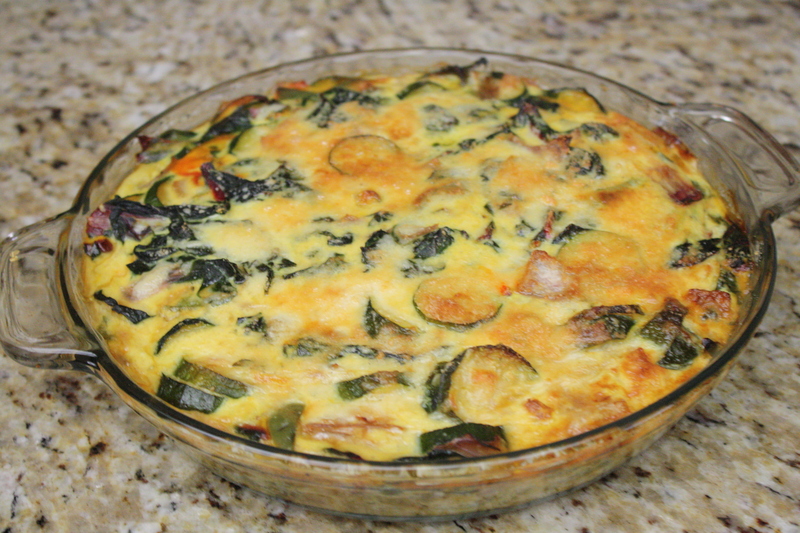 For the second quiche, which just came out of the oven I used Rainbow Chard, 3 small Zucchini, 1/4 of a big Red Onion, and a small green pepper. I also added some Parmesan cheese on top of the veggies prior to baking. Preheat oven to 325 degrees F. Butter a 9-inch pie dish and set aside. Place the chard in a large pot, cover and cook over medium heat just until wilted, about 3 minutes. Remove from the heat and spoon into a strainer set over a bowl. Let cool. Press hard on the chard in the strainer with the back of a spoon to remove most of the moisture, then squeeze in your hands to remove more. Turn out onto a cutting board and coarsely chop Place between two layers of paper towels or wrap in a clean kitchen towel and press to remove more moisture. You should have about 1 cup packed chard. Set aside. Heat the oil in a large skillet over medium heat. Add the mushrooms and cook, stirring until tender, about 5 minutes. Add the garlic and cook for 1 minutes more. Add the chard and coo and let all the moisture evaporate, about 3 minutes. Remove from heat. Add a pinch of salt (the cheese is salty, so you won’t need much) and pepper to taste. In a large bowl, whisk the eggs until light. Stir in the almond milk . 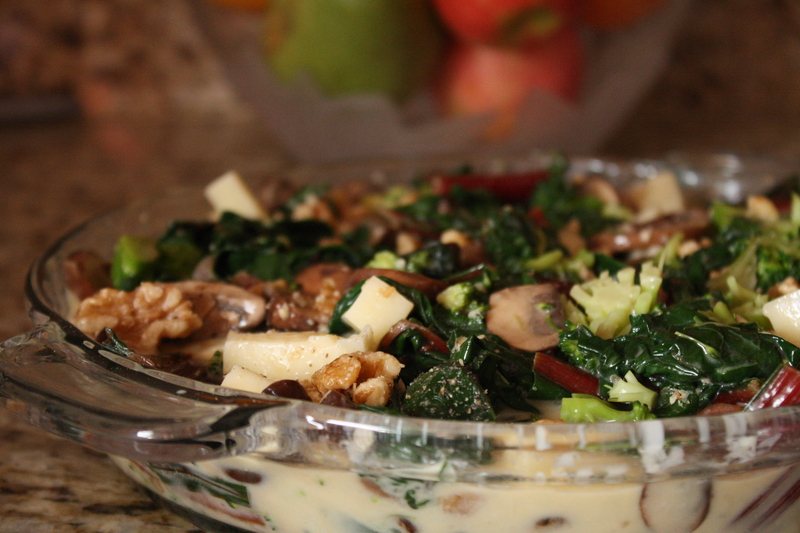 Spoon the vegetable mixture evenly into the buttered pie dish. Sprinkle with the cheese and nuts. Pour in the egg mixture. Bake the quiche until puffed and golden brown, for about 35 minutes. Serve warm or at room temperature, cut into generous wedges and enjoy! ← Pink Hummus with Beets!